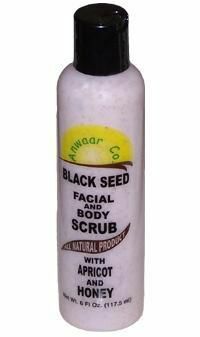 This gentle and exfoliating scrub quickly helps to remove dark spots and dead skin cells. It also promotes a smooth and healthy shine to your skin. Directions: Wash Face and/or body, and apply liberal amount of scrub, gently massaging in a circular motion. Rinse off with warm water. Black seed is an anti-oxidant. Ingredients: Deionized Water, Vegetable Gycerin, Emulsifying Wax, Rosemary, Aloe Vera, Black Seed Meal, Shea Butter, Cocoa Butter, Honey Vitamin E, Apricot Seeds.